MOON 'DARSHAN' MIRACLE AT SAI BABA'S FUNERAL? Indian press claimed it a miracle that the moon was visible during SB's funeral in daylight! Sathya Sai Baba claimed to have appeared on the moon - a darshan, but at the time the sky was overclouded in Puttaparthi, so none of the massed crowds saw anything! Many devotees elsewhere said they "saw" this, and several concocted bogus images of his face on the moon! His was a truly lunatic showing. World astronomers, including NASA were unperturbed as they made no mention of anything unusual. Sai Baba always had a lot to say about the moon, since it figures largely in Indian scripture and superstition in ways in which it naturally does in the culture and beliefs of all largely pre-industrial and simpler 'primitive' societies. He identified the moon as the 'presiding deity of the mind' (Sathya Sai Speaks Vol.14, p. 330 and Vol 12 p.13) , and insisted that the mind is strongly influenced by its phases, that the "mind is a reflection of the moon". (What this really means is, of course, anyone's guess, but it probably sounds rather good to eager believers, who were never allowed to pin him or his statements' meaning down any further). The full moon is supposed to be the best time for 'destroying illusion' (Sathya Sai Speaks Vol.1 p. 21f) and the mind is, according to him “powerless” at the new moon! If you happen to have a moderate attention span (or want to wait until a full moon to try to take in Sai Baba words on this!, here is his mix of 'eternal 'divine' confused superstition on the subject:- "The mind is like the moon which received its light from the sun. It has no light of its own. It receives its light from the Atma (i.e. 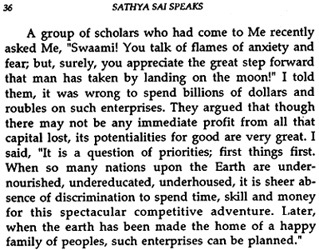 eternal soul" (p. 37 Sathya Sai Speaks, Vol 20.) "The mind arose from the moon," says the Purusha Shuktha. The Moon has sixteen digits. Likewise the mind has sixteen digits. On Shivarathri night, fifteen of the Moon's sixteen digits are invisible, so only one digit can be seen. The mind also is in the same state." Comment: If you can make any reasonable sense out of that (he never explains it better anywhere), then you're a better man than I am, Gunga Din! 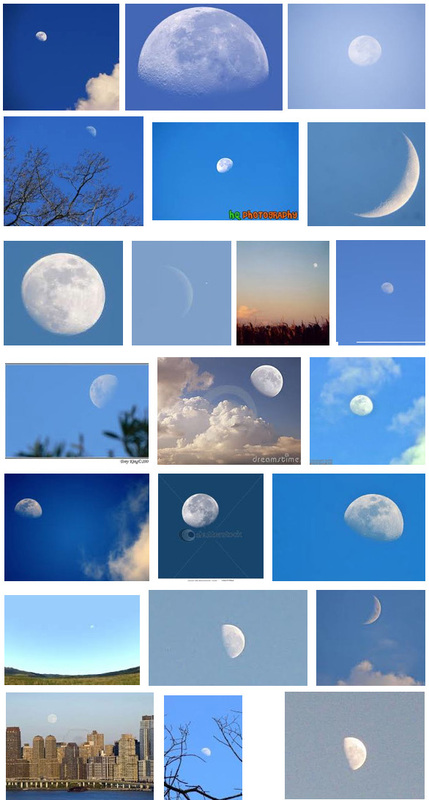 The world community – not to mention its millions of scientists - has not noticed such a huge decline in mental abilities concurrent with the moon’s phases. "The residence of the soul in the Chandraloka is what the Hindus refer to as the time spent as a Deva in Heaven or as an Angel according to Christian and Islamic religions.... thousands have risen to that position." 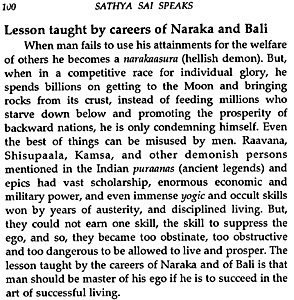 (p. 50, Sathya Sai Vahini). Comment: So this is a doctrine of Angels as well as Demons (Sai Baba calls his detractors demons)... just like in olden days. There is also both heaven and hell (Narakaloka) in his world view, though - typically for him - he has also elsewhere denied that hell exists - except figuratively on earth! "The achievements of technology which have taken man to the moon are also events in the Cosmic Drama, where the principle performers are only working out His Plan; identification with the adventure and its success or failure will only make the performers proud or depressed --- states which would not help inner peace and joy." Comment: What superfluous burbling” However, Sai Baba - with ‘His Will’ - has actually planned the moon visits as part of His Drama! Even though he deplores them completely! Being allegedly Omnipotent - a very great mystery, isn't it? IF you can believe him at all, THEN it must be a mystery! You cannot say 'Sai Baba is God, he is genuine, but some of the things he says are not right', because he has proclaimed he is infallible, knows everything, created the entire Universe. See also links to articles documenting the various claims and reports etc. Did Sai appear on the moon? Is Indian ‘Godman’ Sai Baba’s Moon Waning Still Further? Why build moon rockets when Sai Baba has mantras? Oops! Apparently Sai Baba DID appear on the moon? Sai Baba on the Moon – photo for his birthday?